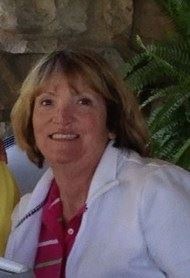 Catherine Lois Condon, age 65, died peacefully on March 25, 2019 in The Villages, FL after a short illness. Cathy was born in Toledo, Ohio to Evelyn (DeHainaut) and Sidney Ross. She was a graduate of Sylvania High School and the University of Toledo. Cathy worked in the healthcare field (including St. Charles Hospital in Toledo and Women’s Health Care in Evansville) for 42 years. Cathy also lived and worked in Cincinnati, Denver and Indianapolis. Cathy married John M. Condon on September 22, 1979. They had two children, Mike and Jill.Cathy lived many years in Newburgh, IN, where she was a Past President of the Castle High School Soccer Club and a member of Rolling Hills Country Club. Cathy moved to The Villages, FL less than a year ago. She enjoyed playing golf and seeing old and new friends there. Cathy was preceded in death by her parents. She is survived by her loving husband, John; son, Mike (Tammy); daughter, Jill; sister, Nancy Kloss; brother, Mike (Sue); sisters-in-law, Carol DeMario (Craig Van Horsten) and Marcia Merando (Bob); brother-in-law, Marty; grandchildren, Lydia and Colleen, and numerous cousins, nieces, and nephews. The family will receive friends at the Reeb Funeral Home, 5712 Main St., Sylvania, Ohio on Sunday, March 31, 2019 from 4 pm until 8 pm. The Mass of the Resurrection will be celebrated at St. Joseph Catholic Church, 5373 Main St., Sylvania, Ohio on Monday, April 1, 2019 at 10 am. Visitation begins at church at 9 am. Entombment will follow at Toledo Memorial Park in Sylvania. The family requests that any tributes in Cathy's memory be made to Catholic Charities of Northwest Florida/Hurricane Relief and mail to PO Box 6330, Pensacola, FL 32503 https://ccnwfl.org/hurricane-michael/ or to a charity of the donor's choice.